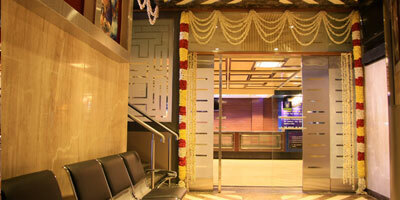 T.N.K.Group of Companies is well known in the business and industrial circles in Chennai. Their association with the film industry started from 1936 with the establishment of Devi Films Private Limited, now merged with T.N.K.Govindaraju Chetty & Co.Pvt.Ltd. T.N.K.Govindaraju Chetty & Co.Pvt.Ltd., are the owners of “T.N.K.House”, a six storied commercial complex at Anna Salai, Chennai-600 002, Tamilnadu, India. Devicineplex stands as a symbol of architectural beauty and design, it is located in the very heart of Chennai City, housing multi-level State of the art four Cinema halls vi. DEVI, DEVI PARADISE, DEVI BALA, DEVI KALA on different floors of the same building. Devi Theatre was opened on 23-05-1970, Devi Paradise on 05-07-1970, Devi Bala on 12-08-1971 and Devi Kala on 21-11-1974. All the four cinema halls are fully Air-conditioned with chilled water system, comfortably cushioned push back seats, tastefully done interiors, subdued lighting and all modern amenities in every respect. 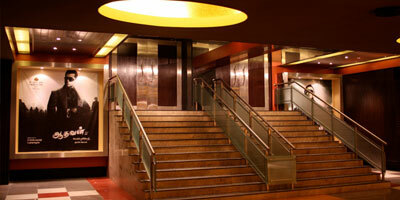 The building has a smooth flowing ramp connecting all floors besides two semi circular elevators. Each Elevator can carry 10 persons. The Elevators have Power Door Centre Opening Glass Door over SS Frames. Safety features of the Elevators are, Digital Position Indicator in Landings, Battery Operated Emergency Light & Alarm Bell, Infra Red Door Screen, Fireman Switch & Overload Indicator. The entire complex is powered with captive generator sets totaling 735 KVA. Devicineplex is the first to introduce online reservation for car parking and valet parking facility. DEVICINEPLEX, is proud to announce that Devi Audi is now equipped with the Top of the Line BARCO SERIES II PROJECTOR - DCI COMPLIANT DP2K-32B for its unmatched Quality, Image Sharpness & Brightness, Vibrant colours and exceptionally Rich contrast levels and also with Qube XP-I DIGITAL CINEMA SERVER-IMB. The newly installed amazing High Gain screen with SEAMLESS JOINTS TECHNOLOGY with a CURVILINEAR width of 72 feet and 30 feet 6 inches height and with a projection distance of 133 feet with an amazing projection quality. 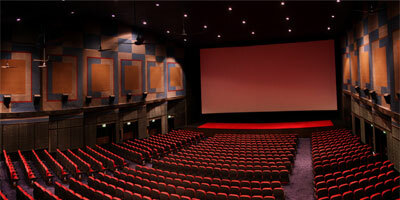 The first “STATE OF THE ART” Cinema in India to install DOLBY DIGITAL AND DOLBY DIGITAL SURROUND-EX SOUND SYSTEM. This system was installed by Mr.Michael Denner – Cinema Application Engineer of DOLBY Laboratories, Inc., England and Mr.V.Kishore, Dolby Sound Consultant, Chennai, India. It is also equipped with DTS Digital Sound System with JBL Professional Amplifiers and Speakers (USA) and Strong (U.S.A.) Ultra 80 Xenon lamp 7000 Watts Projection System, German make ERNEMANN 7000 Watts Projection System and Strong Endless Loop Platter System, the first of its kind in Chennai. Devi has a capacity of 838 seats. Located on the third floor, this Cinema Hall is now equipped with the BARCO SERIES II Projectors – DCI COMPLIANT DP2K – 32B for its unmatched Quality, Image Sharpness & Brightness, Vibrant Colours and exceptionally Rich Contrast levels and also with QUBE XP I Digital Cinema Server – IMB. HARKNESS High Gain Screen is installed to deliver excellent brightness, colour rendition and contrast for maximum presentation quality. This Cinema is also equipped with STRONG INTERNATIONAL, U.S.A. SIMPLEX 35 – PR2000 MILLIENNIUM PROJECTOR with STRONG (U.S.A.) HIGHLIGHT II XENON PROJECTION CONSOLE – TYPE 72000 and Strong Endless Loop Platter System with JBL SPEAKERS and QSC MX SERIES Amplifiers, DOLBY DIGITAL and DTS DIGITAL Sound System. Devi Paradise has a capacity of 1047 seats. This cinema is equipped with most sophisticated Dolby Digital 3D projection, a revolution in 3D cinema using Barco Digital projector DCI Compliant 2K DLP Cinema projector prefitted with Dolby 3D color wheel kit and Qube XP-D-Digital cinema server (DCI Compliant) – D Cinema. Dolby's unique approach to 3D also means that you can enjoy a perfect image from any seat in the house. Even better, the Dolby 3D glasses are an environmentally sound alternative to the throwaway glasses of other systems. 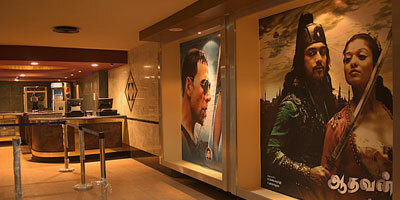 For unforgettable 3D at its best, experience Dolby 3D at Devi Bala. You'll find yourself immersed in the movie, with 3D so real the action all but leaps off the screen. Colors are more natural, and the picture is so clearly defined, you'll want to reach out and touch it. The Dolby 3D glasses are installed with Anti-Theft Tag. The Dolby 3D Glasses are for in theatre movie-viewing only. Glasses do NOT block sunlight. Outdoor use may be hazardous. DEVI BALA is also equipped with Xenon and STRONG Endless Loop Plattersystem andDTS Digital sound system with JBLProfessional Amplifiers and Speakers and QSC DCA Amplifiers to deliverEXCELLENT SOUND QUALITY. Devi Bala has a seating capacity of 308 seats. Located on the SECOND FLOOR, this Cinema hall is equipped with SMART STEREO with DTS Digital Sound System and JBL Speakers, Projection system installed with Xenon and Strong Endless Loop Platter System and QUBE Digital Cinema. 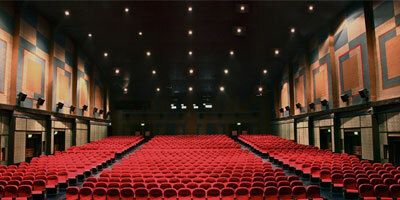 Devi Kala has a capacity of 269 seats. With the Technical support of Mr.V.Kishore, Dolby Sound Consultant, Chennai, India, we maintain the best International Technical standards of Picture Presentation and Sound Quality and use “STATE OF ART” Equipments to give the Audience the utmost viewing experience.